Loved it!! Great staff, great facilities, delicious breakfast buffet and close to most of the action! They take care of you from start to finish! Would definitely go back. Great hotel close to centre of town This hotel was a great way to experience the glory of the temples of Ankor. 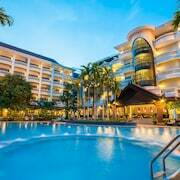 If you are keen to book a cool place to hang out in Siem Reap, lastminute.co.nz has plenty of options. Check out the 469 places to crash within a 10-kilometre radius of Siem Reap's centre. 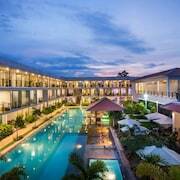 Siem Reap features some great hotels that are within a 5-kilometre radius of the downtown's bright city lights. 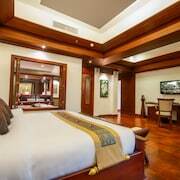 The Palace Residence & Villa Siem Reap is located 8 kilometres from the main part of Siem Reap. Or, alternatively, the Belmond La Résidence d'Angkor is situated 8 kilometres away. 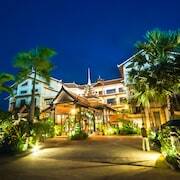 Some other places to stay are the Park Hyatt Siem Reap and the Raffles Grand Hotel d'Angkor. You'll find a number of hotels and apartments in Old Market Area, situated 8 kilometres to the south of Siem Reap. 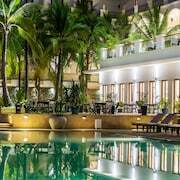 Hotels here include the Amatao Tropical Residence and Anantara Angkor Resort. Situated 7 kilometres from Siem Reap is Siem Reap International Airport. 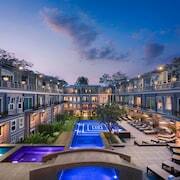 Stay nearby at the Palace Residence & Villa Siem Reap or the Raffles Grand Hotel d'Angkor.